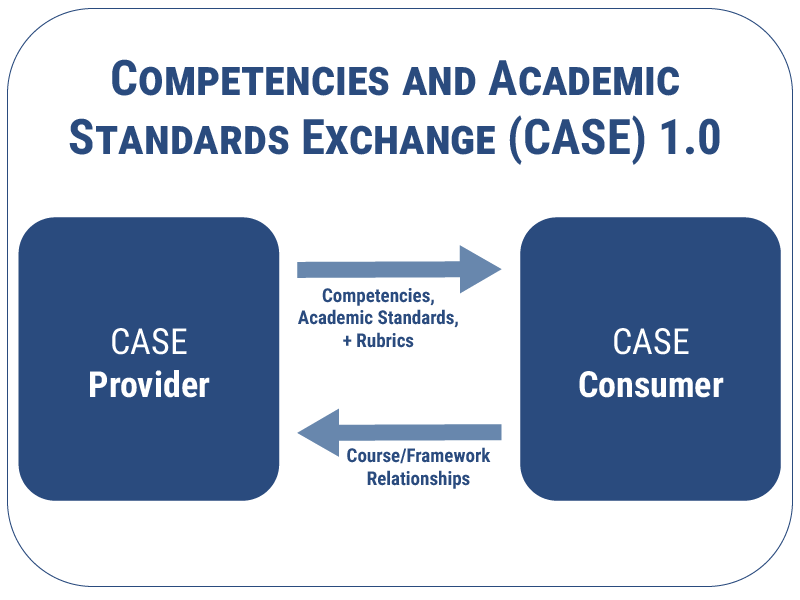 The Competencies and Academic Standards Exchange (CASE) specification defines how systems exchange and manage information about learning standards and/or competencies in a consistent and digitally-referenceable way. The aim is to replace inefficient ways of documenting and referencing learning standards and competencies, which are typically published as a PDF or HTML documents or in spreadsheets, with one which can be managed in modern database systems, within and across institutions in machine-readable form. What education scenarios are supported by the specification? In a K12 context, currently learning standards and competencies are being interpreted as they are translated from static PDF documents into machine-readable formats. The authorizing body for a set of standards is often not involved nor are the identifiers for a given academic standard or competency the same across different platforms. Thus data transmitted from one system to the other can’t be easily aggregated or aligned. With CASE, education competencies are in the same format using a universal identifier defined by the statement's publisher, making aggregation of data more reliable and efficient. This specification also support the exchange of competency-based data and course relationships between systems - including support for one-to-many and many-to-many relationships. Digital content providers wishing to align content to multiple standard sets must make their own decisions about the relationships among the standard sets in order to do this. With CASE, the learning standards authorizing body has the capability to make available indicators as to how their learning standards align to other standard sets. In higher education, organizations adopting competency-based learning models need to manage their competency structures using database systems to achieve efficient scale. Competencies must be related programs, to courses and modules, assessments, course materials and learners's records of achievement . CASE is the way that competencies are tagged, referenced and reused across systems and across organizations. An institution that publishes their competency framework in CASE form can easily share all or portions of its competency structure across the internet to align with academic and professional standards and reference frameworks. All competency frameworks published in CASE format can be linked together in a network of equivalent or aligned competencies. In addition, rubrics and outcomes data can equally be transmitted between platforms and tools. A certificate or diploma granting body establishing performance criteria for an end of program review can now make that information available in CASE format to be consumed by the learning platform and other digital tools. Suppliers, academic standards and competencies authorizing bodies, such as state departments of education, and institutions benefit from a common way to reference learning standards and competencies. What problems are being solved? Educators have a more reliable way to ensure digital content is properly aligned to learning standards. Systems that are traditionally course-based can now have access to related competencies that are taught in a course, module and topic. What are the specification features? Ability to define relationships between and among autonomous learning standard sets. What is the normal process flow? CASE defines two roles, a Provider and a Consumer. Learning Standards and Competency authorizing bodies or institutions or their proxy can create and make available a standard set or sets for import into a consumer system, such as an learning management system or formative assessment system. Does this update or replace one or more existing specs? This is the initial version of the standard specification. What additional information is important about CASE 1.0? When adopting digital content, learning platforms or other systems offering learning standards-alignment as a part of their features, it is very important to understand whether the system supports the interoperability and assurance of the possibility of common alignment afforded by CASE.